Appearance: A slightly heavy-set raccoon with dark gray markings. 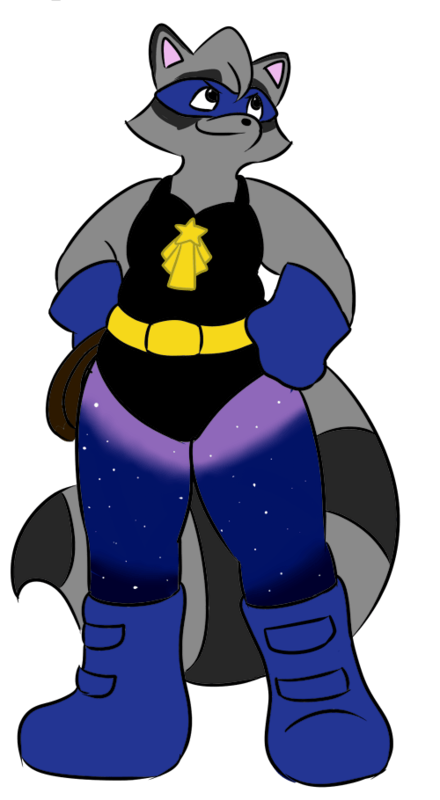 In her superhero suit, Shooting Star wears a black leotard with starry tights gradiating from lavender to navy, blue boots, gloves, and mask, and yellow belt and star emblem. Family: Estelle is on good terms with her family; her older brother Astin occasionally helps at her shop, while her other older brothers Zeke and Sterling live in Duckberg and the family ranch respectively. They and their parents pay occasional visits. Darkwing Duck: Shooting Star idolizes Darkwing and will jump at any opportunity to work alongside her hero. Quiverwing Quack: Shooting Star and Quiverwing Quack mutually encourage each other; it was Quiverwing who suggested Shooting Star’s current name and theming (she had previously gone by Ringtail). Cheerful and earnest, Estelle is for the most part easy-going with a tendency to go with the flow and let any negatives roll off her and a genial attitude… but also impulsive and easily distracted, having taken up heroing on the spur of the moment and capable of being thrown off by an interesting detail that may or may not be related to what she’s doing at the time. When she does focus, she can laser in on an activity or idea for hours at a time, overlooking obvious things outside her current tunnel vision; at her best she can combine her focus and her eye for detail into a formidable force, but it’s not something that comes altogether easily. As well, she is superstitious and can be fearful of anything with a supernatural dent – she tends toward careful rituals when unpacking new antiques, and is easily upset when such rituals (or any routine) is interrupted. She’s also fidgety, often playing with spinner rings (or the end of her whip if in costume) and doesn’t take kindly to having her fidgeting mocked or called out – it helps her stay grounded – and can lose her temper if called a ditz or space case. Estelle’s bursts of hyperfocus do have their advantages – she easily memorizes facts and details about things that catch her interest, giving her an eclectic mix of knowledge with surprising uses, and even her distractable side has its advantages in allowing her to notice something out of place that others might not. Having lived with them her entire life, Estelle takes her own quirks in stride and displays great patience for the idiosyncrasies of others, making her a sympathetic ally if one only asks (and sometimes even if they don’t). A ranch girl by upbringing, Estelle grew up out in the country aiding with her family’s ranching and developing odd skills ranging from competitive whipcracking, barrel racing, and lassoing. Never at the top of her class but a gifted athlete in Greco-Roman wrestling, Estelle earned a scholarship in the sport moved to Saint Canard directly out of high school to attend college in the big city and then moved on to leading tours with her art and architectural history degrees. Finding the job unfulfilling, she took out a small loan and opened an antique store that she happily operated for several years… until she accidentally came into possession of a valuable artifact that put her shop in Negaduck’s sights. Rescued by Darkwing Duck and Quiverwing Quack, Estelle found herself inspired – and, on impulse, dug up her high school wrestling and competitive whipcracking skills to take to the streets as a masked crusader in her own right (originally operating under the name Ringtail). After a bit of a false start due to not using said skills in years (and being mistaken for a burglar), she warmed up to the routine and, at Quiverwing Quack’s suggestion, took up the more distinctive name ‘Shooting Star’. Character created by and belongs to Bunnikkila.